Resident evil 7 biohazard, the newest installment in the resident evil series sure packs a punch, or rather scares your wits out. The game delivers intimate horror, sinister atmosphere, helpless characters and all the trappings that you expect from a survival game. The best part of it though is the unpredictability as you would turn a corner or move into a room expecting something to turn up, but it does not and when they turn up in the dark alleys or dungeons you are least expecting them to. The spooky music specially the sudden changes in its pitch adds more to the already existing distraught that the game puts the player in. The sound design adds more to the unpredictability as it rises and rises at points, making you expect someone to grab you, but that does not happen and so you are left on the verge of your seat on any single noise or sound. As the name suggests, Biohazard is based on the creation of the villains by contamination with a hazardous virus which spreads when a scientific experiment with a young girl goes wrong, leaving her infected with the contaminant virus. She can infect people psychically and the one’s she does so come under her control and also develop capabilities to regenerate themselves in case of injuries. She infects Ethan’s girlfriend Mia and the Bakers family as she has always wanted to have a family. The Bakers under the control of her behave violently and many of the members of the Bakers family try to kill Ethan and so he has to kill them in order to survive. She causes hallucinations within Ethan too when he comes with an antidote to kill her. Later Ethan working with the corporation that had developed the contaminating virus manages to develop an antidote for the virus and is faced with a choice of whether to save his wife or the Bakers daughter Zoe. This choice determines the ending where if Ethan has not cured Mia, he drops his phone from the helicopter which has the last message of Mia saying goodbye. If he has cured Mia, she will be alive on the helicopter that picks Ethan. The virtual reality version that has been added from this part. In-fact, it is advised to first play the play station or PC version before going for the virtual reality, one as it is too scary on the first hand. 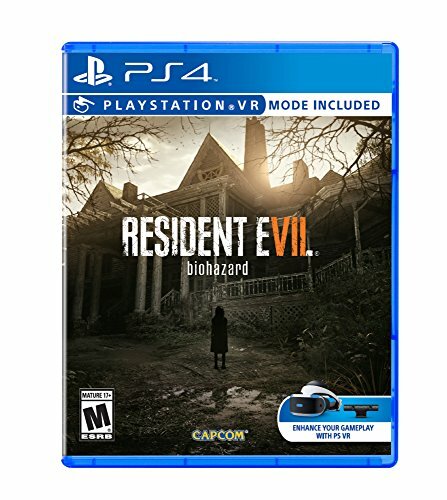 The first person view which is unique to this resident evil version is more engrossing, more entertaining and certainly brings more scare than the previous versions. You will feel as if you are dragged into the storyline and the surprise elements work better on the first person. 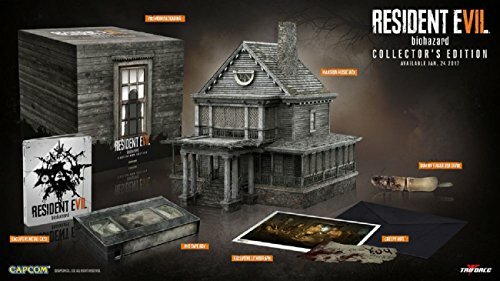 The dingy setting, the dark atmosphere, stunning visuals and one of the best sound designs accompany this resident evil version making it stand out among its peers. This game offers you choices to change the outcome of events, with a choice that reflects on the ending creating a happy ending or a sad ending. The multilayered villain structure with the boss villain being revealed only at the end adds to the suspense factor in the game and also to the scare factor. The facial expressions of the characters do not change much and thus gets a bit monotonous after a point of time. There are far too less interacting objects in the game. Except for the villains you only have Ethan’s girlfriend Mia and the Baker’s daughter Zoe as the characters. There are too few villains. Fighting with the Bakers and the Molded become boring after a point of time and you are left wanting for more. The game is too short. It only takes about 12 hours or maximum a day to finish the game. The punch in the game does not pack a punch. The main paradigm shift in the game which is expected to leave you in awe seems to be non-linear and so does not really have the effect it is expected to on you. Concluding, Biohazard surpasses its predecessors in many ways and delivers a fine, scary, but delightful experience to its players. Even playing it in the personal computer is sure to keep you on the edge of your seat and leave you wondering if you are being watched when you go to the kitchen at night or to the bathroom. The experience will continue to haunt you for days after you finish your game. This is perhaps the reason that playing it first on the virtual reality is not that advisable. The game has taken from its predecessors and surpassed them. The last scene shows a plane containing Ethan rising and Umbrella Corps written on it.The wonderful movement with sharp controls and superb sound design combined with the sinister atmosphere and the dingy, dirty and scary setting keeps you glued to your seat and that’s where this game manages to score. The game mainly tells the story of Ethan as he battles his way through the Bakers house to save his girlfriend Mia. There are only two kinds of villains in the beginning, the Bakers and the Molded. But the game does well to create a multi layered array of villains and does not reveal the boss villain till the end. Also, the game has a happy ending or a sad ending depending upon the choices that you make. This game is different from its predecessors on the grounds that it has a first perspective view while its predecessors had a third perspective view. The first person view is more engrossing, more entertaining and scary. Option to create a happy ending or a sad ending. Boss villain revealed only at the end adds to the suspense factor. Boring as facial expressions of the characters do not change much. There are too few villains.